Violence can only be overcome by love. An armed intruder meets an unexpected response at an elementary school in Georgia. 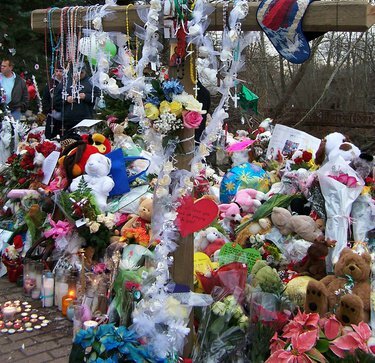 Memorial at Sandy Hook Elementary School. Credit: Shutterstock. All rights reserved. The attack on Tuff’s school took place in August, 2013, and it prompted thoughts about the massacre that had unfolded a year before in Sandy Hook, Newtown, Connecticut, when 26 people died. But perhaps it’s more useful to think about the shooting that didn’t happen. How did Antoinette Tuff in Georgia save the day? When she told a heavily-armed intruder “I love you,” this love was not a sentiment. It’s doubtful that she actually felt emotional love for such a threatening figure. In fact she said later that she was “terrified.” Instead, this love was the wisdom to see a hurting human being in a distraught young man, to detect his deepest need in the loveless and alienating societies we’ve created in the modern world. And she had the courage to act on that awareness. In her actions she was following a pattern that writers from Cicero to Boethius had developed thousands of years ago for talking people out of depression, or dissuading them from acts of desperation. It was called the consolatio: first, identify with the distraught person – in her case Tuff shared details about her misery in her own life. Then contextualize the person’s suffering: others have been through this too, Tuff said, you’re feeling hopeless today but it could be different tomorrow, and things are going to be all right. Next, exhort the sufferer to do the right thing by giving them back their sense of agency - she asked the intruder’s permission to call the police after he laid his guns on the reception counter and got face down on the floor. I’m not pointing out these parallels as a mere literary exercise. What these writers did was to codify a pattern they must have observed many times in response to emergencies. Why don’t we apply this same logic in the present day? In effect there were two completely different systems in place to protect Tuff’s school in Georgia. One consisted of police and metal-detecting doors that had to be activated by an insider. This system completely failed. The would-be killer slipped in behind a teacher who was cleared to enter, while the police were worse than useless. They almost ruined what Tuff was trying to do when they made their presence known outside the building and the intruder started shooting at them. On the 911 tape that was later made public, the police were recorded screaming orders at the young man who was already lying face down on the floor with his hands behind his back. The other “system,” if you will, was the aptly named Antoinette Tuff – a courageous woman who had received some training for dealing with eventualities like this, if not on quite this scale. Her minister at church had taught his parishioners a technique called “grounding” which, as she tells the story, she relied on throughout, along with praying. She succeeded brilliantly, saving the 800 or so children who were in the school that day. But the point is that her life-saving response was precisely not a system in the sense of something that already exists at significant scale. We know things like this can happen, but we haven’t thought of institutionalizing effective, human responses even though they work. Logically, it should be possible to develop the capacity to reject what causes alienation and embrace what draws us closer to each other. This might start small - or it might seem that way - but we can all grow and express the non-sentimental love that Tuff exhibited in large-scale systems by drawing on the personal strength that’s inside each one of us. After all, what is the war system if not anger writ large? What is corporate capitalism if not greed writ large? What is the American prison-industrial-complex if not fear writ large? Fear, greed and anger when undisciplined and ignored will destroy us. And if these disruptive, alienating drives can be built into whole institutions then their opposites like community and peace can be built into our social behavior too. What would our institutions look like if we had enough faith in ourselves to protect our children with that kind of power? For one thing, problems of discipline in schools would be dealt with by using the principles of restorative instead of retributive justice: instead of an instrument of vengeance, justice requires that we work to restore all those who have been injured by a crime. Restorative justice is a growing phenomenon adopted from experiments in New Zealand and a number of indigenous cultures that has worked well in schools where it’s been tried. Both victims and offenders report high levels of satisfaction. There are two other things that can be done. First, have “peace teams” on hand in the most troubled schools. Such unarmed teams already patrol the streets of New York and Chicago, and they also exist in Mindañao (the Philippines), South Sudan, and the Caucasus among many other places. They have been proven to be effective in mediating between opposing parties and preventing the escalation of small-scale conflicts. Second, let’s get serious about teaching children peace. Our educational systems rarely acknowledge the fact that human beings have rich inner resources to draw from that connect them with each other. All these changes can be phased in gradually, without asking people to take a leap into the void, allowing for transformations to occur through a build-up of confidence rather than a giant leap of faith. Schools are a microcosm of society. If we do these things in schools, we could them in other institutions too. It’s time to go beyond defensive campaigns to end one form of violence or another. Instead we should build up cultures of nonviolence where empathy and mutual respect are developed in the same ways that more destructive drives have been embedded up to now. In his book, “War is a Force That Gives Us Meaning,” Chris Hedges concludes that war can only be overcome by love, but also that love cannot be organized. However, love in the form of active nonviolence can certainly be organized in the ways I have suggested. What we need to do is to organize this form of love, not only for one-off emergencies or temporary campaigns, but as the formative principle of all our institutions.